Guest started a topic WARLORD OF MARS RETURNING IN NOVEMBER!! Just finished number 2. Very good I thought, it picking up from the first issue and looks like being an exciting story. Well drawn too. I'm personally treating everything as a clean slate now in terms of past comics. Since Dynamite and ERB Inc. have joined forces, its a whole new ballgame. In my mind, when it comes to the new Dynamite stuff published with the blessing of ERB Inc...it's going to be the original Burroughs stories, and the new Dynamite stuff as canon. But who knows, Dynamite doesn't seem to be overly concerned about continuity in their other pulp titles. I like that, no use of letting continuity get in the way of telling good stories. Plus it makes each series and mini series more accessible. I'm going to just assume this all takes place after the last of the previous Dynamite series, I suppose, with anything following up on unfinished business as "as yet untold tales" that I hope we eventually get. That final Dejah Thoris miniseries seemed to contain hints of a forthcoming alien invasion of Barsoom, but after reading the new John Carter series, I'm no longer convinced that the invasion hinted at is THIS one, now. "Non-classic" is a pretty subjective descriptor here, but Marz refers to the novels after the original trilogy (Princess/Gods/Warlord). Beginning with the fourth novel, (Thuvia Maid of Mars), Carthoris took center stage as the main hero, followed by others like Tara of Helium and Gahan of Gathol (in Chessmen of Mars), Vad Varo - originally Ulysses Paxton of Earth (in The Master Mind of Mars), and Tan Hadron of Hastor (in A Fighting Man of Mars). Carter and Dejah weren't front and center again until Swords of Mars, which was followed by yet another novel (Synthetic Men of Mars) in which Vor Daj (a padwar of Helium) is the main hero, and the next (actually a collection of four novelettes) centered around Llana of Gathol, Carter and Dejah's granddaughter. Finally Carter returns again as the main hero in the novelette Skeleton Men of Jupiter, which forms one half of the final Barsoom book, John Carter of Mars. Oh wait, I hadn't read far enough: "Starting with the fourth book in the series, John Carter takes a backseat to new Barsoomian heroes..." Oh! Okay, that's a bit clearer, I think. Interview with Ron Marz but still no idea when this takes place, whether Carthoris has been born yet or not. This is frustrating me. 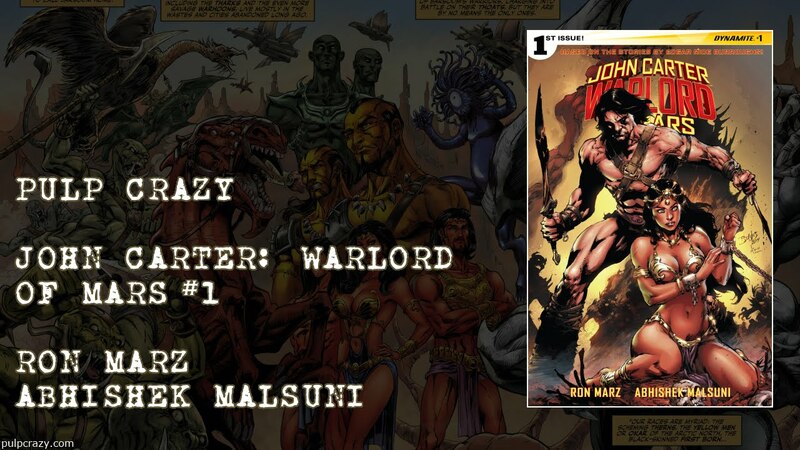 Ron Marz was nice enough to answer some of my questions about the new JC: Warlord of Mars comic, as well as the previously published Shadow Over Innsmouth One-Shot. Good review, do you also post reviews on ERB Online comics? Thanks rasx. As a matter of fact... I'm working on getting caught up on a few series. Once I am, I'll be doing a whole episode devoted to the ERB strips. I think the first issue shows a lot of potential. The artwork is gorgeous, I was blown away by it. I hope to see more action scenes though now that the landscape has been established. This first issue was sort of like treading water while waiting for the main event to begin. I was also blown away by the artwork. Dejah has never looked sexier in the interior artwork. I understand the need to make this accessible to first-time readers who've never read any of the novels or DE's previous WoM comics, so in that sense issue #2 will be more like the actual first issue for people like me. I stand pretty unimpressed so far by both the villain, and his ravaging hordes of a (as you say, pretty stock) warlike alien race. I actually have little hope of the aliens being developed beyond one-dimensional savages who'll essentially act as an extention of the main villain's will. It would have helped a little if they'd at least been more original looking in design, less humanoid, to distinguish them somehow. As it was, they could have shown up in any '90s issue of Marz' SILVER SURFER or GREEN LANTERN. They're introduced, along with the main villain, with the sketchiest of background, but that's about it. Hopefully, once we get some background of the main villain's backstory he'll develop into some kind of credible threat. With John Carter lost and presumed dead in the Martian desert, his enemy’s triumph is all but assured. But who is Captain Joshua Clark of Earth, and why does his hatred for John Carter know no bounds? As Dejah Thoris prays for her warlord’s safe return, the shocking origin of John Carter’s arch-enemy is finally revealed! Superstar writer Ron Marz and rising-star artist Abhishek Malsuni continue their acclaimed, official run! I posted a variation of that idea on this site years ago--suggesting that an escaped slave from Virginia (maybe even was whipped by John Carter) finds himself on Barsoom. Obviously, over the course of the adventure, a peace would occur between the two characters. I cannot see John Carter (despite fighting for the Confederacy) being a slave owner. Nobody knows exactly how old John Carter is, and for all we know he may have been a slave himself at one time or another.